Aegidienberger Horses are a small riding horse from Aegidienberger, Germany, and were first recognized as a breed in 1994. Aegidienberger Horses were developed by Walter Feldman in 1994 in response to the need for horses larger than Icelandic Horses but still small and hardy enough to navigate difficult terrain, plus they need to be well suited for the warmer climates of central Europe. Feldman created the Aegidienberger breed primarily by crossing Peruvian Paso and Icelandic horses. Aegidienberger horses generally stand between 13 and 15 hands high. Their colors vary considerably and can be bay, black, brown, buckskin, champagne, chesnut, dun, grullo, perlino, roan, and white. 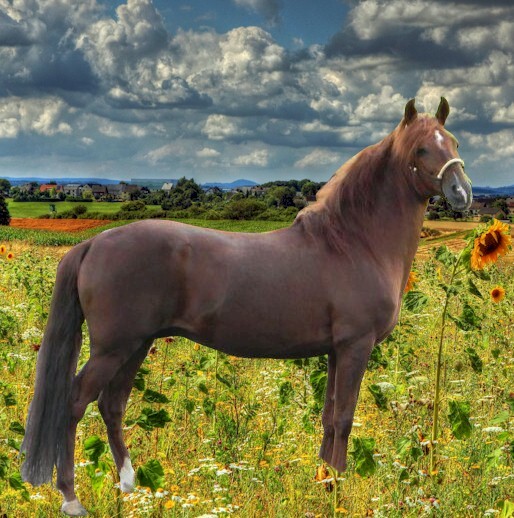 They are strong and sturdy, with high set tails, with thick hair on both mane and tail. They have a friendly and gentle temperament, yet a strong personality. They are excellent riding horses, are very intelligent, and have an amiable and willing nature. They are sometime used for agricultural work and generally work very well with people. They can perform a gait known as the tölt. The tölt is a four-beat lateral ambling gait known for explosive acceleration and speed. Like all lateral ambling gaits, the footfall pattern is the same as the walk (left hind, left front, right hind, right front), but differs from the walk in that it can be performed at a range of speeds, from the speed of a typical fast walk up to the speed of a normal canter. Some Icelandic horses prefer to tölt, while others prefer to trot; correct training can improve weak gaits, but the tölt is a natural gait present from birth. There have never been more than 100 Aegidienberger horses at any one time, as the breed has declined since the inception of the American horse stud book in 1868.